A few months ago I visited a friend of mine and I was amazed with the Amazon Echo he owned. It can play music, control the house lights, tell me news and weather status, and even the date and time, all of that with just voice commands. At that moment, the maker inside me shouted "why don't I make it myself!". And since that day I started to search for components that could help me to make an arduino based Amazon Echo, until I found the amazing 1Sheeld. 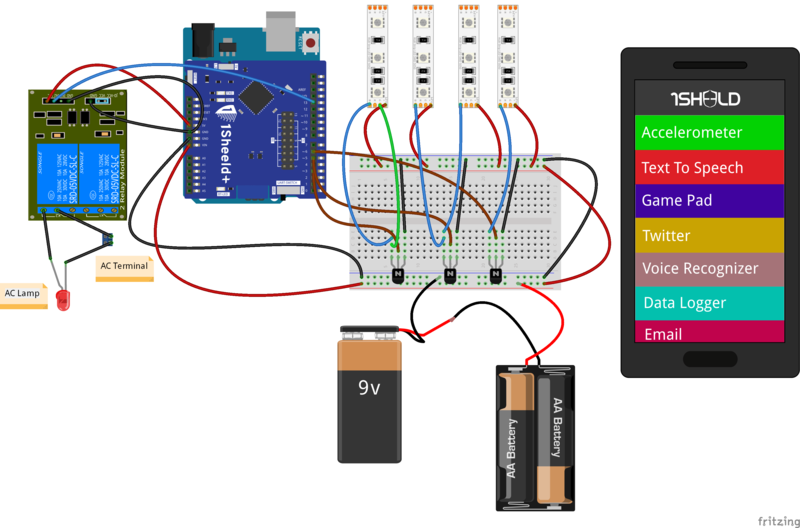 1Sheeld is a platform for Arduino that allows you to tap into your smartphone's sensors and capabilities and let you use them in your Arduino projects. Basically, it is a hardware shield that sits on top of your Arduino board and communicates over Bluetooth to this Android app, to transfer data between it and your smartphone. You can check the getting started tutorial on 1Sheeld website which will take you step by step till you can operate the 1Sheeld very smoothly and it's an awesome reference for great Arduino projects. I have used in this project five shields from the 40+ shields in the 1Sheeld. You can manage any libraries from Arduino's IDE. Just click Sketch >> Include library >> Manage libraries >> type OneSheeld >> then click install and you are good to go. ​ Or you can download the library from here: http://1sheeld.com/downloads/ Then open your Arduino IDE then chose sketch from the menu bar >> Include library >>add .zip file >> then chose the zip file yo just downloaded. Download the 1Sheeld mobile app from the website or you can visit Apple play store or Google play store to get the app. Then press the multiple shield button.